Would you leave your well-paid job at a multinational company after ten years to become a nanny in a children’s home in Transylvania? And would you dedicate your life to helping children with problematic family backgrounds instead of working for bigger market shares? Éva Nagyfalusi did it. 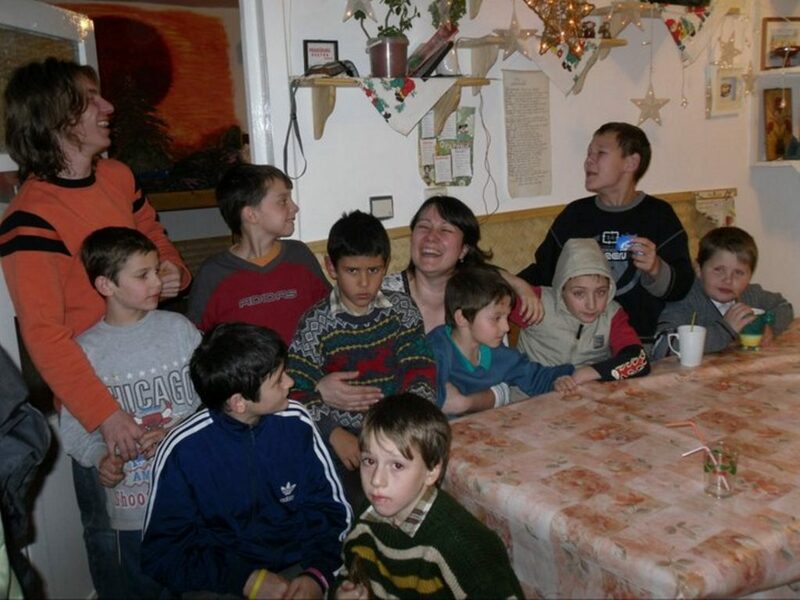 TransylvaniaNOW: Why did you decide to leave your career behind and become a nanny in Déva (Deva in Romanian) at the Saint Francis Foundation instead? Éva Nagyfalusi: Following University I started to work in a multinational company in Budapest. After the first five years, when I was already a member of the management team, I realized that I earn so much money with this job that I was able to save some each month. So I stared to save money consciously in order to be able to quit in a few years’ time and start to do something more meaningful for less money, but still avoid becoming financially vulnerable. I thought instead of profit and market shares I could work for goals serving the eternal life, like working for the elders, the poor, or the children for example. To understand this you have to know that I was raised in a Christian family, my parents are practicing Christians, but I was already an adult when I started to think about what Jesus wants to tell me personally. This is how I got to the Saint Francis Foundation founded by Father Csaba in Déva in 1993. To the foundation which has grown a lot during the past 25 years, having nowadays 82 houses all over Transylvania and helping 2,300 children. TN: How was your first week when you arrived to Déva from Budapest? É.N. : I arrived on a Thursday afternoon after Eastern in 2010. Friday morning I was invited to the office and had been told that a nanny had just left a few days before and I would have to take over ten boys in a block house. Before that I had been in Déva only once and I only saw the monastery. I had never seen such an apartment before, which looking back I think was a good thing, because if I would have, I might not have dared to undertake the job. So on Friday afternoon the boys arrived from school, some of them even went home for the weekend and the first days went by smoothly but on Monday the problems started. The boys did not obey me, they started lying about not having any homework etc. It took half a year until they accepted me, and started to obey. The first six months was the hardest from this perspective. TN: What was the biggest difference between your new and your previous life? É.N. : Lack of privacy. I arrived here from my life as a single. I used to have time to rest and deal with my own things but living together with ten children I had no private time at all. It is a 24/7 job. Then I realized this is like motherhood, with the difference that a mother has nine months “preparation” time, while I got into this from one day to the next. But I all got back later what I had lost at the beginning. I actually got back even more. Let me give you an example. After two years, when we moved from the apartment to a house I could make my own vegetable garden. This was something I always wanted to do, but never had the place and time for it in Budapest. TN: What is the hardest part of being a nanny? É.N. : When you have ten children, some of them will be more to your liking than the others. But Jesus himself asks me to accept everybody. And I have to do that even if he lies to me or steals something from me. Father Csaba says that “Love is a conscious decision even if my heart doesn’t want to.” On a -10;+10 scale I don’t have to have a +10 relationship with everybody, but I must reach at least level 0. I can’t afford to go into the minus range – otherwise it would be awfully hard for both sides to live together. But in the long term all kids realize that we want to help them, and all that effort is not wasted. Even though they usually don’t show their gratitude in everyday life, after they graduate from school they are really grateful. For example this spring we were repairing the roof on our house, and all the boys whom I raised during the past years, came back to help us. They stayed with us for a whole week and showed a good example for the children as well. It was an uplifting week. 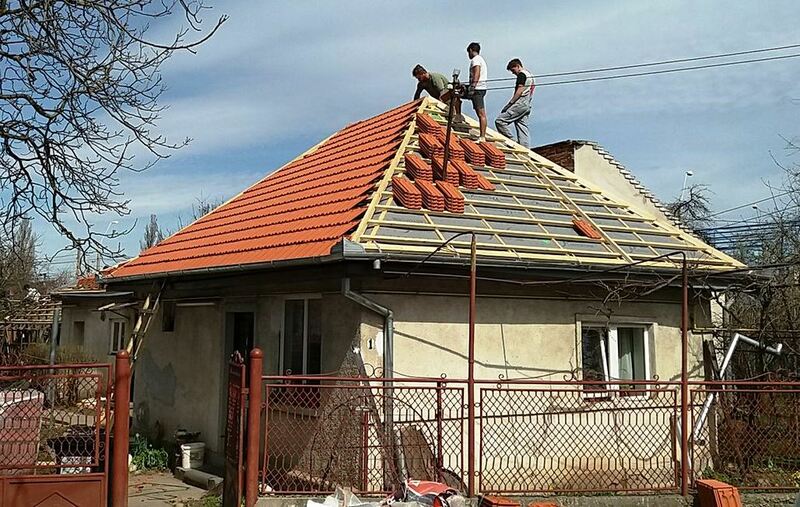 Roof repair in 2018. The older boys who already graduated came back to help. TN: Besides taking care of the boys, do you have other duties within the Foundation? É.N. : Yes. I’m also doing various organisational tasks, like distribution of donations, and keeping contact with contributors both from Hungary and Germany and I also have a new role since August. After more than seven years of being a nanny, I was asked by Father Csaba to become a house manager instead in another town. So I moved from Déva to Székelyhíd/Săcueni where I have to direct the nannies and organize the life of the whole center. TN: When you arrived to Déva you didn’t speak any Romanian. What about now? É.N. : Within the foundation we speak Hungarian, but since in Déva only eight percent of the people are Hungarian, I began to learn Romanian right after my arrival and now I speak it on a basic level. But living in Székelyhíd now, in a town near the Hungarian border where 95% of the people are Hungarians, I don’t really need to use my Romanian anymore. 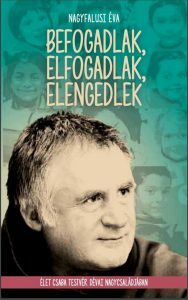 Cover of Éva’s book with the face of Father Csaba. TN: After ten years in the private sector, and eight years at the Foundation what’s your plan for the future? É.N. : I’m sure I am going to stay at the Foundation for at least the next five years. But this lifestyle is really demanding, I am not sure how long my strength and patience will last. I will let God decide that. What is certain that I feel that I’m at the right place and my work is meaningful. Éva also wrote a book about her experiences. She started to write a blog right after arriving to Déva which later turned into a full novel published only few weeks ago in Hungarian. Her plan is to translate it later into German and English too, so the foreign benefactors can also have a look behind the scenes of their work. Title image: Éva Nagyfalusi and some of her wards.